Fraudo.com | Preventing online fraud. Signing up victims to fake accounts – a scammer rings a victim to “connect” them to the NBN for a low price. They sometimes demand payment through iTunes gift cards. Gaining remote access to computers – a scammer pretends to be from NBN Co claims there are problems with your computer. They try to convince you to run commands on your computer to gain remote access and steal personal information, install malicious software or demand payment to fix “problems” they have discovered. A scammers impersonates NBN Co to steal valuable personal information like your name, address, Medicare number, or driving licence number. The scammer may tell the victim they’re entitled to a new router, and say they need these personal details to confirm the victim’s identity. If you’re not expecting a phone call and someone calls you claiming to be from any company (your bank, your network provider, your insurance company, your tax department, etc), never give them any personal information until you can confirm who they are. Get their name, tell them you’ll call them back. Hang up, look up the company’s main number on Google, call them, and ask to speak to the same person. This way you know who you’re talking to before giving out any personal information. If you receive an unsolicited phone call asking you to run commands on your computer then it’s a scam. Any organisation asking for payments in gift cards (e.g. iTunes cards) is a scam. Please talk about these scams with older people, they’re more vulnerable because all of these NBN changes can be confusing. A new research paper highlights the security risks in pacemakers. In short, some pacemakers can be reprogrammed wirelessly, and their security isn’t good enough to prevent hackers. Someone would have to be standing quite close to the victim for this to happen, but it’s very concerning that it’s possible. The consequences, of course, are deadly. What can you do? Talk to your doctors, make them aware of the problems. The manufacturers need to feel pressured into improving security. Ransomware is a very large problem these days. It happens when someone tricks you into downloading and running some code (like in an attachment). Usually the email or website will tell you something scary (like you’ve been fined for something you didn’t do), or promise to show you a funny or interesting video. The downloaded software immediately encrypts your documents with a secret password, and a message asks you to pay money to receive the password to unlock your files. Apparently many people pay the ransom, totalling about $18 million in 2016. That’s crazy. If this happens to you please don’t pay. Don’t encourage this kind of crime. You have other options. Firstly, keep a backup of all your documents. This is the most useful thing you can do today. You have so many good options for backups, including some good cloud storage services. If anything happens to your files you can just restore the backups instead of paying huge amounts of money. This website is run by some very good security companies: Europol, the Dutch National Police, Intel Security, Kaspersky Lab, Bitdefender, Check Point, Emsisoft and Trend Micro. So you can trust their advice. I don’t have an account with ANZ. So it’s obviously a scam. I didn’t request any accounts to be deactivated. They wouldn’t normally do this without you requesting it. If a bank really did deactivate my account they would send me a letter in the mail, on official letterhead, in a branded envelope. They wouldn’t use SMS or email. 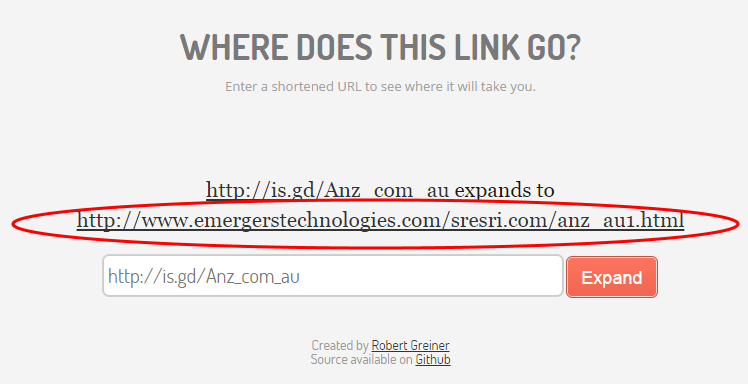 This is the most important clue: the URL at the end is from “is.gd” – this doesn’t sound like anz.com.au, it’s completely different. So what is a “is.gd” domain? Firstly, .gd is the top level domain of the country Grenada. Not something an Australian bank would use to communicate with their customer. But apart from Grenadian businesses it’s commonly used as a novelty domain because it sounds like “good”. Next, “is.gd” is a URL shortening service. I’ve written about URL shorteners before. What you need to know is that it’s used to shorten (or hide) the real URL. So by looking at it you can’t know where the URL goes. You might be tempted to click on it to find out, but I wouldn’t recommend that. Clicking on untrusted URLs is one way to get malware. So not the ANZ bank’s website. We can stop here, we don’t need to click on the link. We already know it’s not really from the bank, they already lied in the original SMS so their motives are probably malicious. What about the sender’s phone number? Can it be identified? No. SMS allows senders to change the “from” address or phone number. You need special software to do it but it’s not hard. So In this case the sender is “Message”, which is also suspicious. But really, anyone can put anything in the sender’s phone number. Just like with email. Delete the SMS, no harm done at this point. And if you tell your friends and family about it (maybe show them the SMS before you delete it), you’ll be raising awareness of the scam. This is the best way to fight back, reduce the chance of others falling for it. If you receive a similar SMS (with different wording) you can share it here in the comments. 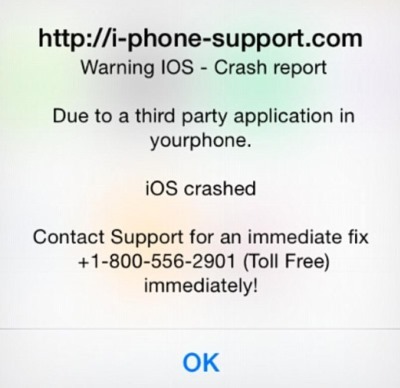 If you see the following message appear on your iPhone, it’s a scam. Some code on some web pages causes the web browser to show an alert with some “scary text”, urging you to quickly call their phone number. After you call they’ll ask you for money for their (fake) support, from $19 to $80. Of course, there’s nothing wrong with your phone and you’d be paying for nothing. It’s a scam. If this happens to you and you can’t get rid of the messages, close Safari, put the phone in Flight Mode, go to Settings, Safari Settings, and clear history and website data, then turn off Flight Mode. Due to a third party application in yourphone. There will be other variations of this text. If you find other versions please let me know in the comments below.